The much awaited 2019 Endeavour is finally here. With more features and better pricing, can it give the Fortuner a run for its money? 2019 Ford Endeavour gets a new base variant with a manual gearbox. Continues to be powered by same 2.2-litre and 3.2-litre diesel engines. Gets passive keyless entry, engine start/stop button and a hands-free tailgate. 2019 Endeavour is priced much lower than the previous model. The Endeavour, which was first introduced in the country back in 2003, has been among the most rugged, burly and solid SUVs that have ever graced our roads. With its boxy and muscular design and can-do-anything attitude, the Endeavour has always been a favourite among SUV enthusiasts. However, a lot has changed since its early days in the country. The mighty Endeavour has gone from being a utilitarian 4x4 to a feature loaded, modern day SUV. The second-gen model was first launched in 2016 and now Ford has given it a midlife facelift with more features and a spanking new price tag. 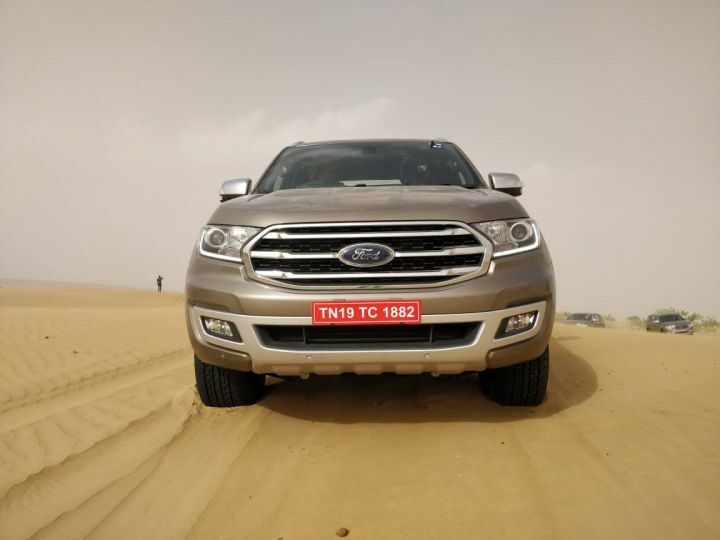 The 2019 Endeavour has been launched in three variants with prices starting at Rs 28.19 lakh for the all-new base Titanium manual variant with a 2.2-litre diesel engine and going up to Rs 32.97 lakh (both ex-showroom) for the 3.2-litre automatic variant. Yes, the Endy now gets the option of a manual gearbox as well. Apart from this, the carmaker has also slashed the prices of the existing variants as well. Here’s the detailed pricing of the 2019 Endeavour in contrast with the outgoing model. As you can see from the table above, the 2019 Endeavour not only has a lower starting price now thanks to the manual base variant, but also gets a price cut across the entire range as well. Since this is a mid-life facelift, Ford hasn’t tinkered around much with the tried-and-tested design of the Endeavour. Apart from a few minor cosmetic changes, which include a new grille and bumper, the 2019 version looks pretty similar to the model it replaces. It remains a quintessentially big, old-school SUV. It retains the HID projector headlights, front and rear fog lamps, chrome door handles and bulky skid plates. Although it continues to ride on 18-inch wheels, the design of the new alloys is different. On the inside, there isn’t any major overhaul to the design either. The dashboard gets a new black finish instead of the earlier brown one. It also gets some nifty little additions such as chrome accents on the gear knob to add to the premium feel. However, we are happy to report that the Endeavour now comes with passive keyless entry and a push button start/stop feature, which was sorely missed on the outgoing model. While an 8-way power adjustable driver seat is standard, the front co-passenger seat gets the same feature in the Titanium+ variant. Standard safety features include six airbags, ABS with EBD, traction control, ESP, hill-start assist, auto headlamps and wipers, along with front and rear fog lamps. It also gets TPMS (tyre pressure monitoring system), a rear camera, rear parking sensors and a volumetric burglar alarm system that can detect movement inside the car. The Titanium+ variant gets features like an airbag for the driver’s knee, front parking sensors, hill descent control and an auto-dimming interior rearview mirror. Overall, the Endeavour continues to be one of the safest SUVs in the market. The 2019 Endeavour continues to be powered by the same set of 2.2-litre and 3.2-litre diesel engines as before. The 2.2-litre motor is offered with a 4x2 drivetrain with both MT and AT options, while the 3.2-litre motor is exclusively offered with 4x4 and AT. The 2.2-litre, 4-cylinder unit produces 160PS of power and 385Nm of peak torque, while the 3.2-litre, 5-cylinder unit churns out 200PS and 470Nm. We were hoping Ford would have brought the new 2.0-litre Ecodiesel engine (available in the Thai-spec model) to the Endeavour in India as well, but we have to make do with the older engines for now. The Ford Endeavour has always had a sweet spot in the hearts of the SUV community in India, but it has always been playing second fiddle to the Toyota Fortuner - whose popularity just doesn’t seem to diminish. With the 2019 model packing in more features, a manual gearbox and an even more competitive pricing, it’s become an even better value for money proposition than before. So what do you think about the new Endeavour? Would you prefer it over the Toyota Fortuner in India? Let us know in the comment section below.